I’m an aspiring Buddhist. Something we really enjoy thinking about when we’re meditating (imagine incense, chanting, levitation—the usual) is the topic of change. Everything is changing: the person we think we are, our relationships, our communities, and our climate. 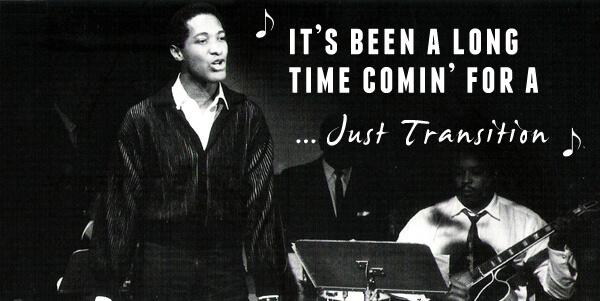 This post is the namesake of Sam Cooke’s classic 1964 composition (listen here). Cooke’s song gave voice to the courageous transition towards racial and economic justice long denied to a massive portion of the citizenry. This just transition was made inevitable by communities most disenfranchised by society. The voice of Sam Cooke is just as prescient today. ‘Transition’ is often a word of choice among my lefty/Buddhist associates. There are many ways to denote change. The question before us now: whose change, whose transition? It’s been a long time comin, but a change gonna come, oh yes it will. The petroleum industry becomes dirtier as it reaches towards the bottom of the barrel to extract the final drops of fossil fuels. And the economic benefits? Well, remember that Christmas gift-wrapped in a box that was bigger than you? And inside was something better suited as a stocking-stuffer? In California, out of ten industrial sectors surveyed, the fossil fuel industry was dead last as a job provider. From the site of extraction, along thousands of miles of train tracks, to the refinery, the health and safety of residents and workers, and the stability of our climate takes a steeper descent. Will we choose to maintain our free-fall into an era of global warming? Or will we choose a Just Transition toward clean energy that powers a green economy, where thousands of green careers are generated? Where public monies are no longer bled into the electoral war-chests of the 1%, but are instead invested in the health, infrastructure, and environment of our communities? A Just Transition towards clean energy and a renewed economy is on the move, thanks to CBE and visionary allies. By 2025 one million Californians could be driving electric vehicles, shutting off a source of particulate pollution especially prevalent in low-income communities of color. Green careers and green energy are being produced in Los Angeles, right now, as residential buildings transform their rooftops into solar power plants. More municipalities are joining Community Choice Aggregation, where local governments secure clean energy as a large portion of their energy supply. Change is gonna come, but whose change will it be? On May 6th East Oakland residents and CBE staff gathered on the steps in front of Oakland City Hall to announce publically: permitting construction of a crematorium in East Oakland is a violation of California Civil Code 11135. In short, CBE has a legal case of racial discrimination and we’ve sued the City accordingly. As we were preparing for the rally, we discovered the local Society for the Prevention of Cruelty to Animals (SPCA) had also scheduled a rally of their own in front of City Hall. I was worried that our message, Oakland’s low-income communities of color continue to be the dumping ground for polluting industries, would be muddled with SPCA’s message of animal welfare. In this moment it occurred to some folks in both rallies that our messages were not far apart. The Neptune Society crematorium is an issue of civil rights and of environmental injustice, but also of animal welfare. The hexavalent chromium, hyrdogen fluoride, mercury, arsenic and other compounds-toxics the Alameda County Public Health Department expects from the proposed crematorium– would be inhaled by humans and dogs alike. East Oakland is overwhelmingly African American and Latino. Residents in this community will watch their lives shortened by 15 years compared to people living in the Oakland Hills. East Oakland, especially for children under five, has one of the worst rates of asthma in the nation. Residents develop cancer, heart disease, and other illnesses at higher rates. Poverty, crime, and the existing cluster of polluting industries conspire to create this grim reality, a reality the cats and dogs of East Oakland are not immune. When the Oakland Planning Commission rubber-stamped Neptune Societies project with the classification, “General Manufacturing,” they stripped East Oakland (and West Oakland, if and when a crematorium is proposed there) of it’s RIGHT to have advanced notice, and to conduct a public and environmental review of the crematorium. Thus, low-income communities of color in Oakland have no say in absorbing the toxic soup from crematoriums. Meanwhile, better-off neighborhoods with an overall lighter skin tone are afforded protections. Where I’m from they call that environmental racism.